Frank and Jody's first foray into senior professional management. Looks like their first acquisition may be a cut price John Terry. All things considered following the Frank and Jody show will probably be far less toxic than next season at the Bridge. ^On the basis that everything the managers do is good, the players are all suspect from day 1 and all rebellions is evil, and that is the consensus here, then it will be a happy thread. Nah, we just rename the thread everytime he moves on, until he rocks up at Cobham. One on the up and one on the down? (I hated SFL being at Man City and I hate him being at DC). Chelsea missed a trick with lamps and Morris. Their seems to be a thought process that they will do well at Derby and they will be back here in 2 years. Absolutely no guarantee SFL will do well at Derby. He is used to working with Grade A players not second tier. The graveyard is littered with great players who failed as managers at average teams. I think a great player is better fit at a great team. Especially his own. Chelsea missed a trick with lamps and Morris. 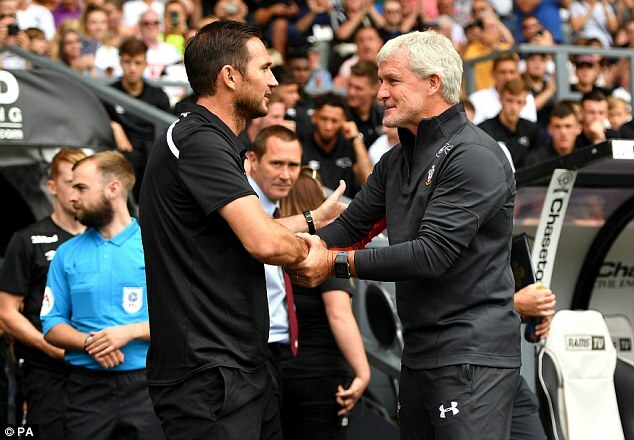 Are you thinking about Lamps and Morris being managers here now then, instead of Sarri? I don't think that works. Besides there a bunch of coaches at Cobham who are higher up the pecking order than Morris. It is true that 3 out of 4 great players fail first time at managing a Championship team. They still have to do it that way though. 9 out of 10 great players fail first time at running a PL team. Yes, right here right now. It might not work but then neither might Sarri. Certainly we'll never know unless we try breaking the mould of wheeling in some foreign coach every two years. I also suspect everyone on these pages would give SFL and Jodie a lot of goodwill and extra time to try something different I.e bringing players through from the academy, giving players like RLC a proper chance, maybe create an English core that once served us so well in the past. And if you want one good example of big teams and big players coaches, Zidane didn't do too bad with Real Madrid did he? What was his experience before Madrid exactly? Some even wanted him to come here this season (once Madrid had taken the initial risk of course). We are just not brave. It has been an amazingly successful mould so far. And if you want one good example of big teams and big players coaches, Zidane didn't do too bad with Real Madrid did he? Do you want 9 good examples of big teams and big player failing coaches? Zidane also spent 6 years coaching at RM before getting the top job. 3) Jodie Morris has spent 6 years coaching at this club (thats a guess but I bet I'm not far off). Anyway I'm not sure the Real Madrid third team counts compared to him quitting the club and managing Granada (for instance). Real Madrid was his first senior managerial post and he smashed it. True or false?